Cheesehead Gardening: Don't eat the watermelon! 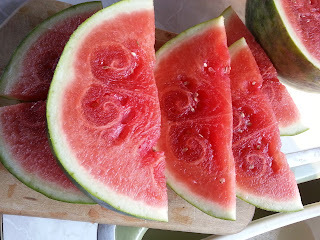 This watermelon looked so cool when we cut it open this past weekend. I love the funky pattern. However word of warning - this watermelon's taste does not match its looks. Yes, it was so overripe it had turned fermented. Didn't even have to spike it with vodka!